The wrought-iron angel on the gate before the tomb identified it with certainty. 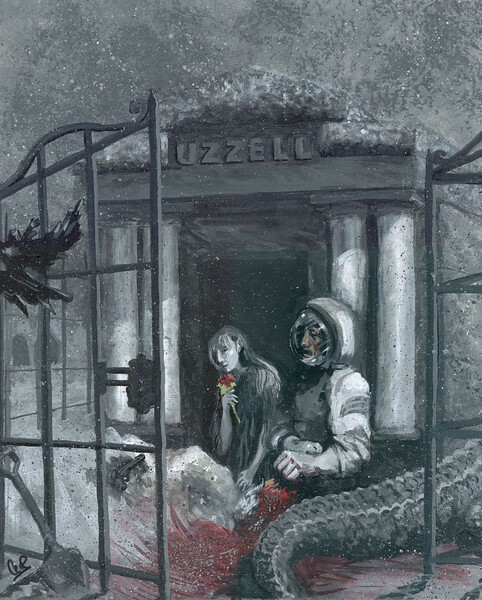 Carefully placing the carnation and then his gun on a mound of snow near the gate, Bill used his gloved hands to dig a little, freeing a shovel concealed against the marble façade. With the shovel, he began to clear ice and the snow that had built up around the gate since his last visit. As the moment came closer, tears warmed Bill’s cheeks. More than anything else came the realization that today was their anniversary. He continued to work, and at last the gate inched wide and the path to the heavy door was cleared. Bill worked clumsily at the locks and opened them. He pulled, concentrating on what seemed the opening of an ancient vault. As the door to Donya’s prison began to give, a blow took him from behind, sweeping his legs from beneath him.